Stuck in a rut, fed up, exhausted – these are all feelings we’ve encountered somewhere along the way. Me too! I think it’s possibly the most normal thing to experience these slumps in life so don’t beat yourself up too much! I wanted to share with you how I tend to pull myself out of a motivational slump! First things first – ditch anything addictive. For me that’s caffeine, chocolate & alcohol. When I’m feeling fed up I will drink 30 cups of tea a day, swap my Freddo for a king size and instead of drinking socially I will add a cheeky bottle of wine to the shopping list. All of the above in the long run only makes me feel worse. So as soon as I start to feel ‘blurgh’ I cut the crap and hit the gym. FYI I am telling you this drinking the biggest mug of tea you’ve ever seen. Have you ever known one of those people that always seem to land on their feet? Well they tend to have one thing in common – they fully believe that they will achieve whatever they set out to achieve. Belief can be more powerful than any form of education you have under your belt. So maybe the people that land on their feet believe that they always will. Enjoy failing. I know, I know, I hate losing too! But seriously what you go through when you fail will teach you so much more and make you so much stronger than a person that has never fallen. Trust that all your failures will lead you in the right direction. I always wanted to be a stylist at Look Magazine it was my dream job and I couldn’t even get an interview and believe me I tried. I tried in every way imaginable to land a job in a magazine and I just couldn’t get through the door. I got rejection after rejection. So I created London Fashion Girl instead where I could in effect be my own stylist for my own magazine. Look Magazine closed down last week joining a number of magazine that have suffered the same fate whilst the blogging world is thriving. Failing at one thing had actually led me on a more successful path. So turn failure into motivation! So now that I’ve settled back into London life you will be seeing my blog get back on track – more blog posts more fashion! This Summer I’m all about floaty floral dresses. This time of year is when I turn into the girliest girl and really milk the pastel shades. This dress is from Asos which you will see amongst several other Asos finds in this weekends Summer lookbook. I really try and recreate those Chloé girl vibes this time of year, it’s such a beautiful look! 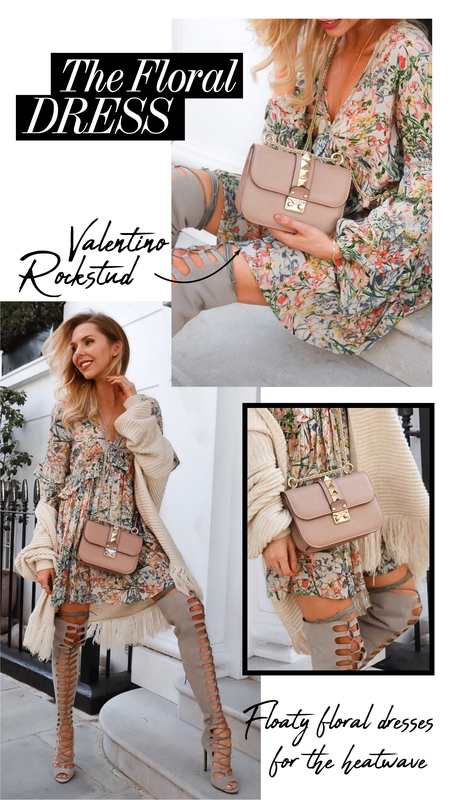 Of course featuring the Valentino Rockstud bag which is the most idyllic crossbody bag managing to be both cute and edgy at the same time! Previous Post NAVIGATING THE SALES! Omg Love it!! ❤️ You are the sweetest for posting this. I definitely have my days too. A motivational article with some thought provoking pointers. I liked the phrase: ‘trust that all your.failures will lead you in the right direction’. I enjoyed this motivational blog. There were a few thought provoking and even perception twisting points which I have noted for further self analysis. Nice one Laura!